Very simple. Practically impossible to fail. Traffic AI leads to huge jams where you wouldn’t expect it. The traffic situation, in particular, was a real Achilles’ heel. The agent-based simulation required good road connections or the whole city ground to a halt – fire engines couldn’t get to fires, so buildings would burn down, and ambulances couldn’t get to houses so people would die… and eventually the traffic would clear up simply because workplaces would shut down from lack of workers. Cities Skylines has these same problems. …that could have been offset by the commuting / multiplayer system, but design decisions there totally broke it too, so it never worked as it should have. Freight – Commerce – Shopping cycle completely disabled because they couldn’t get it to work. You just cannot accuse Skylines of having small maps. A single Skylines map is easily 6+ SimCity maps. They’re more akin to 6 SimCity 4 regions… all on the same map. It’s damn magic. Their freight system – somewhat different to SimCities, but nonetheless similar – is there in all its glory. You are even given several tips and tools to try and keep the industrial freight from clogging up your commuter traffic, and several options for importing and exporting freight that your industry creates and commerce craves. Speaking of clogging up commuter traffic, you have many different types of roads to choose from: Dirt service roads, two-way roads, one-way roads, all from 2 to 6 lanes and then highways and ramps on top of that. So, even though the traffic can be screwy, at least you’re given a bunch of tools to deal with their quirks. It’s not really enough, of course… I still spend the vast majority of my time analyzing why a particular intersection is clogged up, but I find it enjoyable. I always felt SimCity had real potential. If commuting between cities was fixed, the servers stabilized, traffic AI improved enough that freight could be turned back on (I realise a cut-back version of it was turned on at one point) then it would have been a fun little game. After all the problems, though, EA/Maxis abandoned it after 2 lack-luster patches. I feel the same way about Cities Skylines. It has REAL potential right now, but there are problems that pull it up short of being a really engaging city builder. For instance … I’ve not touched the tax rates at all, and I’m just rolling in the cash. In fact, I haven’t looked at my cash reserves for probably the last 10 hours. It’s just not a feature. This then ties into city / suburb / district policies you can set: smoke alarms, big business breaks, small business breaks, high-rise limitations, etc. Basically none of which I’ve bothered to touch because… I just don’t need to. It’s like being a mayor is a license to print money. A HUGE advantage Cities has over SimCity though: It’s published by Paradox. A publisher that is famous for releasing games that are in need of polishing, and polishing them well. All their Europa games, and Hearts of Iron games, and yes, Cities in Motion, got this treatment. 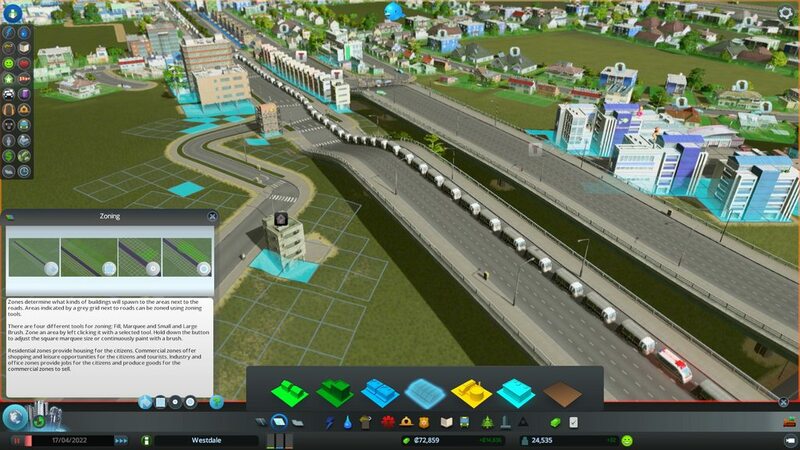 Secondly, Cities Skylines has full modding support that the community is making full use of. Already the Steam Workshop is getting flooded with mods (mostly artwork, but several gameplay changes, such as a traffic inspection tool and an auto-bulldozer) so with some luck we can have balance overhauls to really make this baby shine. Even with it’s flaws, I’m still incredibly addicted to it. I just expect that to wear off within the week (I’ll need to give a second city a go to put my new traffic-management skills to the test from the ground up) but after that? I think I’ll need to wait for some mods to mature there.